In the last couple of years large numbers of black-tailed godwits have been gathering at low water in the river channel just below Pickerings Pasture car park or on Hale Marsh at the high-tide wader roost. Both of these localities are part of the Mersey Site of Special Scientific Interest (SSSI) and RAMSAR site. Until recently we had only seen small numbers (50-100) of this species in this part of the Mersey but in 2011 the numbers increased to almost a thousand birds. They were first noticed in mid-July; a lot of these birds were brick red - their full breeding plumage. Gradually, over several weeks, most of them have changed into their winter plumage. 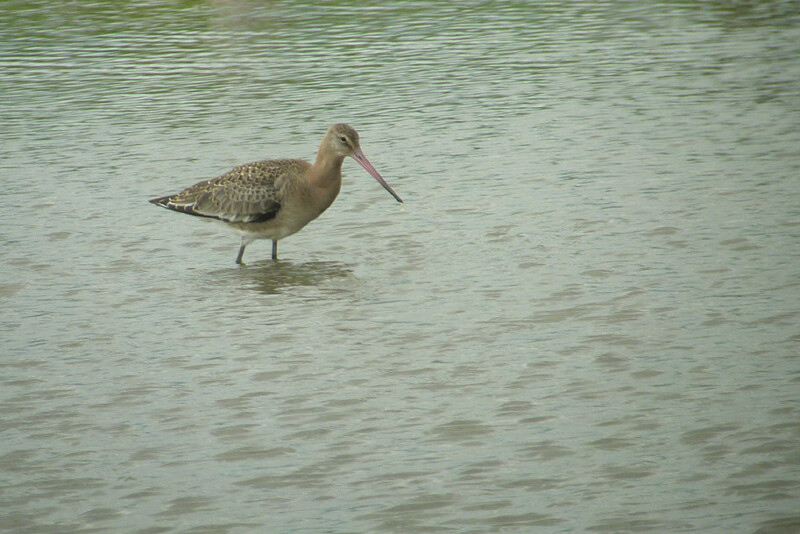 Black-tailed godwit. Winter plumage. Pickerings Pasture. 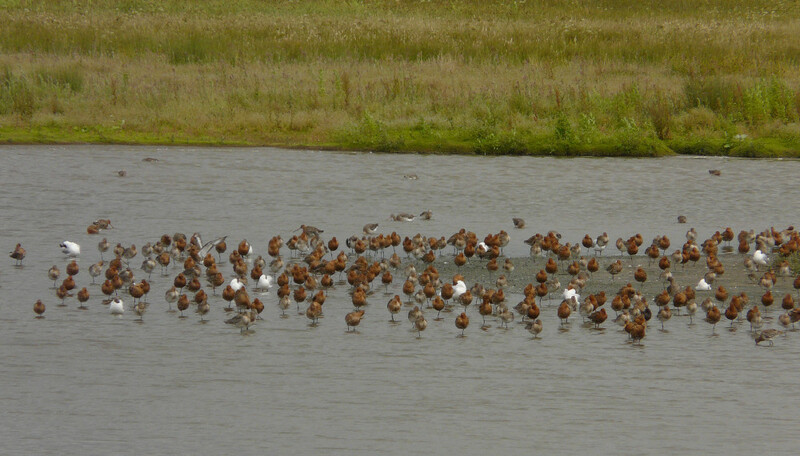 When they first arrived in mid-July they appear to prefer feeding on the fresh water pools at Carr Lane, Hale which are on the higher reaches of the marsh. Numbers continued to increase and up to 1,550 were counted on the 30th July 2011. Later in August they were joined by young birds of the year - very distinct in their juvenile plumages. As the tide came in they would fly to Hale Marsh were they could be seen roosting from the bird hide at Pickerings Pasture. 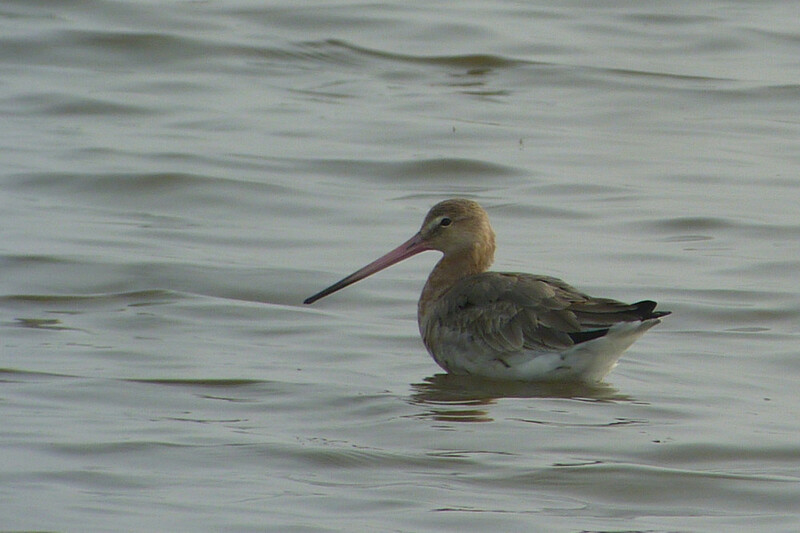 Black-tailed godwit. Juvenile plumage. Pickerings Pasture Scrape. 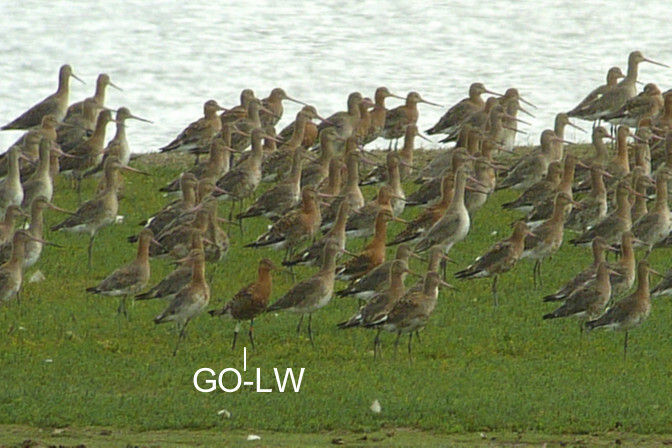 Black-tailed godwits roosting on Hale Marsh. 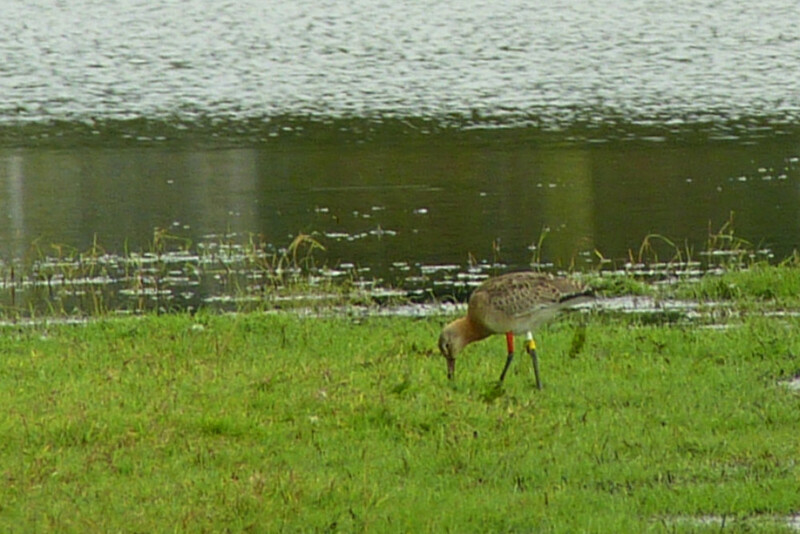 There are two separate races of black-tailed godwit: one (Limosa limosa limosa) breeds in Europe, from Holland through to the Baltic States, and they winter as far south as Mauritania in Africa. 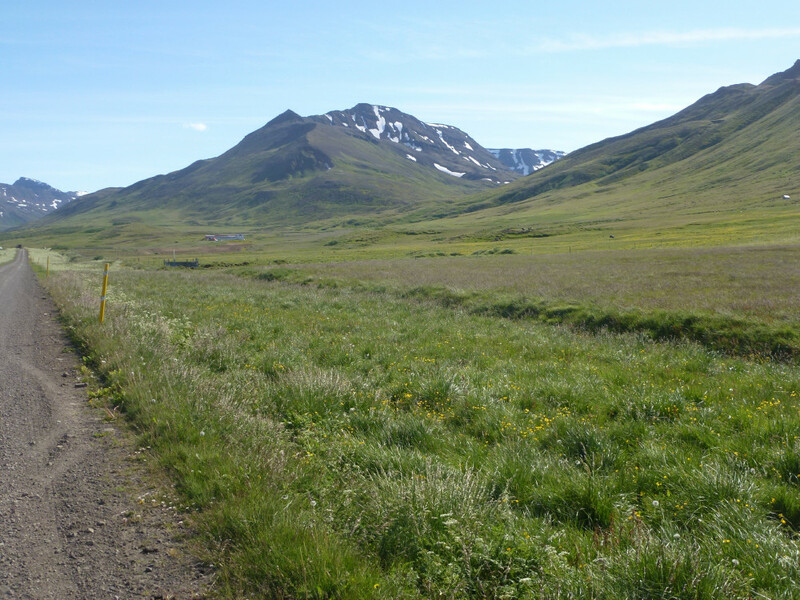 The other race (Limosa limosa islandica) breeds mostly in Iceland and winter as far south as Spain. It was thought that the majority of the birds at Pickerings Pasture and Carr Lane Pools, Hale were of Icelandic origin and this was confirmed as several birds were wearing colour-rings. The black-tailed godwits from Iceland have been increasing in recent years: the reasons are uncertain but it is probably due to milder weather (a possible effect of global warming) which has resulted in the birds being able to rear more young. Another possible reason for the increase is that more of the birds are staying the winter in the UK where they are protected by law: in southern Europe and further South they are more likely to be shot by hunters. 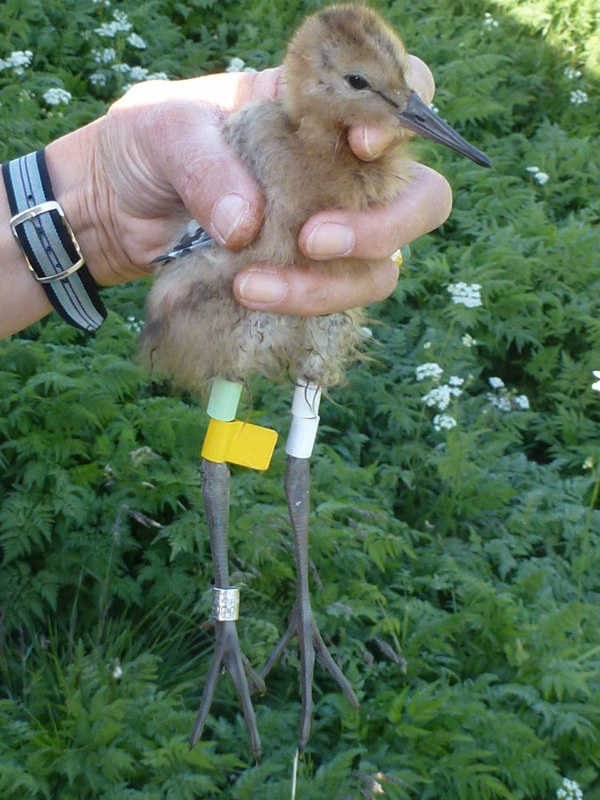 For several years both races of black-tailed godwits have been studied, under differing schemes, using colour-rings. 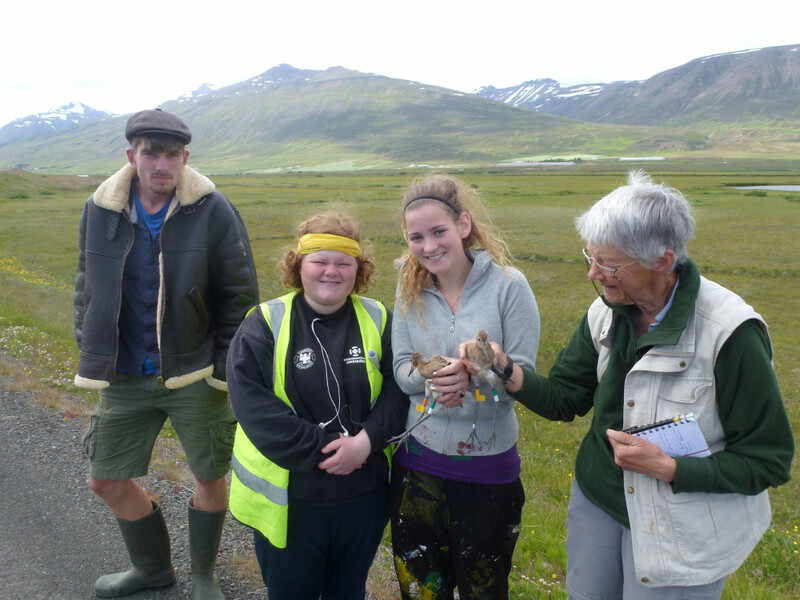 An on-going study known as Operation Godwit has been ringing the Icelandic race mainly by catching and colour-ringing the adults (both in Iceland and at their European wintering areas) and the chicks. This has been very successful with high numbers of sightings of colour-ringed birds giving a wealth of data: showing migration routes, feeding and roosting areas and population dynamics. The results from sightings of colour-ringed birds make very interesting reading – one adult found amongst the high-tide roost from the hide at Pickerings Pasture on 8th August 2011 was ringed Green over Orange: Lime over White (GO-LW). It was ringed on the Wash Estuary in Lincolnshire on 9th September 2002 at Holbeach. It was probably an adult when it was ringed, so the bird was over ten years old. It is not unusual for Godwits to live until they are fifteen, if all goes well. It was next reported at Cley in Norfolk on 24th March 2003 where it remained until 22nd April. Four days later, on 26th April, it was over a thousand miles away at Álftafjörður in Eastern Iceland and was seen there on three occasions up to 1st May. On various dates between 9th August 2003 and 19th April 2004 this bird was seen at Cley although it did pop up to Snettisham for a while in September! Bizarrely it was back in Snettisham the following September before returning to Cley. A similar pattern continued until April 2007 although it also showed up at Salthouse (not far from Cley) on several occasions. Our bird would have returned to Iceland each summer to breed without being noticed but eventually it was discovered at Egilsstaðanes, Egilsstaðir, Iceland on 21st May 2006 and again at Álftafjörður on 30th April 2008. Things changed slightly in 2007: our bird started to appear on the Humber Estuary in the early part of the winter and this pattern continued through until at least 2010. This highlights one of the problems with these sightings: did the bird change its pattern or did a different observer start watching a new area? Whichever – GO-LW continued to spend much of its winter on the North Norfolk coast, particularly at Cley where it was in the company of many others of its species. In 2011 it changed its pattern again and appeared on the west coast on the upper Mersey. 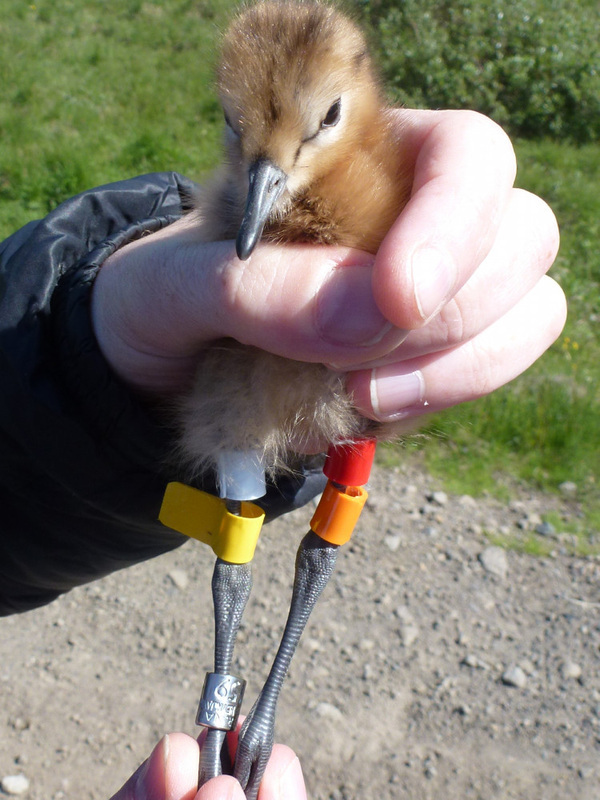 In autumn 2012, at Hale on the Mersey Estuary, ten juvenile birds were seen with colour rings, all of these birds had been ringed that summer as chicks in Iceland. 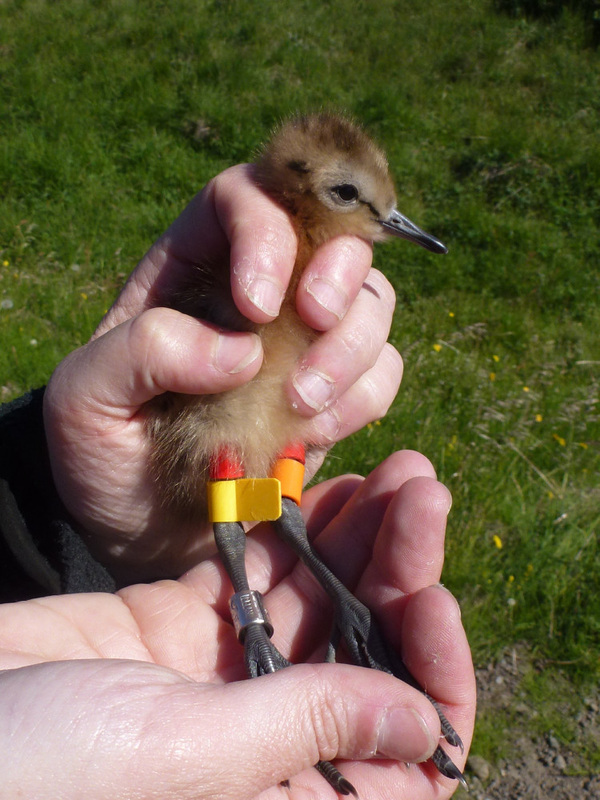 In one case two siblings were at Carr Lane Pools, Hale just over a month after they were ringed as chicks. Considering it takes the chicks about 28 days to fledge and then several days to improve their flying techniques, it appears that after fledging they do not hang around for long in Iceland. the upper Mersey, we know that the godwit numbers build up rapidly in mid/late July. These are adult birds, with the juveniles arriving from mid-August. Whilst they are on the upper Mersey estuary the birds cross over to spend time at Frodsham Sludge Pools and Ince Marshes. After spending two to three months on the Mersey, and possibly with the food supply running low, the large flocks move on. Around this time numbers seem to increase on the Dee estuary. In 2013 the numbers again broke all records on the upper Mersey with a flock in excess of two and a half thousand. They remained here or nearby until the conditions changed: weather and availability of food being the main triggers to further movement. Some move on to the Dee, other west coast estuaries and further south. Large numbers winter in Ireland, others travel into France, Spain and Portugal. Unfortunately the vegetation at Carr Lane Pools, Hale was too long to read the rings with any degree of accuracy during autumn 2013 and only three colour-ring sequences were read. These were also of Icelandic origin although one had been ringed in France as an adult. My thanks go to the organisers of Project Jaðrakan, and especially to Jenny Gill from the University of East Anglia and Pete Potts, who provided the full details of the colour-ringed birds: some of which have been summarised here. Also thanks for the excellent photographs of the ringing locations in Iceland and the chicks which had been colour-ringed there and later seen on the Mersey Estuary. 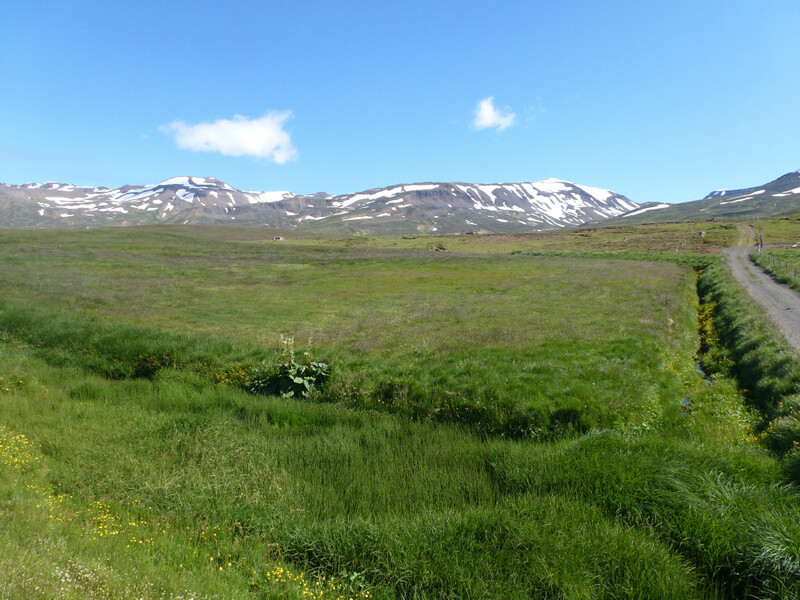 Views of two of the Icelandic breeding areas. Two of the ringers in Iceland. The ringers run an educational programme. The two girls are from a local school.